Establishment of SEZs, EPZ's government infrastructure projects such as tech cities, railway, expansion of state & national highways as well as rising demand for power are expected to fuel the market for diesel gensets in Africa. According to Mega Development Goals (MDG), the African countries aims to develop megacities to accommodate the increase in working age population, which would boost the demand for diesel gensets in the country. According to 6Wresearch, Africa diesel generator market size is projected to grow at a CAGR of 4.6% during 2017-23. In Africa, diesel gensets with rating 5KVA-75KVA accounted for majority of the market volume share due to low electrification rate, growing residential and construction sector. 5KVA-75KVA rating gensets are expected to maintain their dominance in the market throughout the forecast period in-terms of market volume. Growth in mining and oil & gas exploration in countries such as Tanzania, Ghana and Nigeria would also spur demand of diesel gensets in Africa. Amongst all verticals, the manufacturing vertical accounts for key share in the overall Africa diesel generator market share. Retail, commercial offices, hotels and hospitals are the other key revenue contributing verticals. Africa diesel generator market report thoroughly covers the Africa diesel generator market by KVA ratings, verticals and countries. 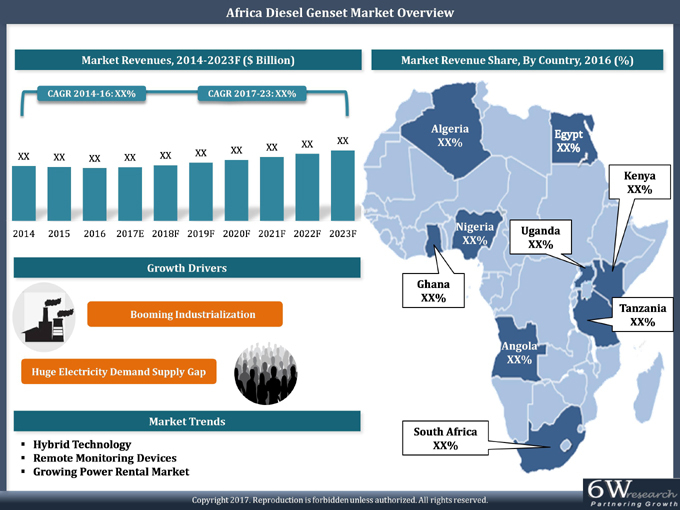 Africa diesel generator market outlook report provides an unbiased and detailed analysis of the on-going Africa diesel generator market trends, opportunities/high growth areas, market drivers which would help the stakeholders to device and align their market strategies according to the current and future market dynamics. • Historical Data of Africa Diesel Generator Market Revenues and Volume for the Period 2014-16. • Market Size & Forecast of Africa Diesel Generator Market Revenues and Volume until 2023. • Africa Diesel Generator Market Size and Africa Diesel Generator Market Forecast Revenues until 2023. • Historical Data of South Africa Diesel Generator Market Revenues and Volume for the Period 2014-16. • Market Size & Forecast of South Africa Diesel Generator Market Revenues and Volume until 2023. • Historical Data of Angola Diesel Generator Market Revenues and Volume for the Period 2014-16. • Market Size & Forecast of Angola Diesel Generator Market Revenues and Volume until 2023. • Market Size & Forecast of Kenya Diesel Generator Market Revenues and Volume until 2023. • Market Size & Forecast of Nigeria Diesel Generator Market Revenues by KVA Ratings by Vertical until 2023. • Market Size & Forecast of Uganda Diesel Generator Market Revenues by KVA Ratings by Vertical until 2023. • Historical Data of Uganda Diesel Generator Market Revenues and Volume for the Period 2014-16. • Market Size & Forecast of Tanzania Diesel Generator Market Revenues by KVA Ratings by Vertical until 2023. • Historical Data of Tanzania Diesel Generator Market Revenues and Volume for the Period 2014-16. • Market Size & Forecast of Ghana Diesel Generator Market Revenues by KVA Ratings by Vertical until 2023. • Historical Data of Ghana Diesel Generator Market Revenues and Volume for the Period 2014-16. • Market Size & Forecast of Algeria Diesel Generator Market Revenues by KVA Ratings by Vertical until 2023. • Historical Data of Algeria Diesel Generator Market Revenues and Volume for the Period 2014-16. • Market Size & Forecast of Egypt Diesel Generator Market Revenues by KVA Ratings by Vertical until 2023. • Historical Data of Egypt Diesel Generator Market Revenues and Volume for the Period 2014-16. • Africa Diesel Generator Market Drivers and Restraints. • Africa Diesel Generator Market Trends and Developments. • Africa Diesel Generator Market Import Statistics.